Do you dream of magical holidays in Marrakesh? The Riad Aubrac vacation ownership resort can turn your dreams into a reality at this exciting Morocco timeshare resort. Only a short stroll to the Marrakech Museum of Moroccan art and history, and to the Medersa Ben Youssef, the Islamic college originally built in the sixteenth century, this shared ownership property is an ideal spot for holidays spent exploring the mysteries of the enchanting metropolis that was once the imperial city of western Morocco. 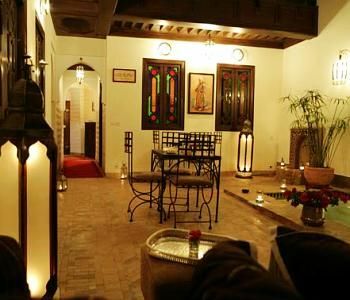 Buying or renting a timeshare resale at Riad Aubrac makes it easy and affordable for you to enjoy your time in Marrakesh. Relax in the indoor pool and enjoy your meals, dining at the onsite restaurant or with a call to room service, savoring your meals on the private terrace just outside your holiday apartment. Other services you will appreciate include babysitting, an airport shuttle, and on-site car rentals. This Marrakesh vacation ownership property has six rooms: the Jonquille, the Myrtille, the Bouton d' Or Twin Room, Marguerite Suite, Gentiane, and the Bleuet. Each unit is distinctive, which adds to the feeling that you are enjoying a holiday in your own personal vacation apartment. The Jonquille Twin Room sleeps up to two vacationers and has a patio, a private bath, and a roomy, walk-in closet. The Myrtille Twin Room is also designed for two but offers the option of adding one additional twin bed. This romantic, first-floor unit has a private bathroom and a terrace. Bouton d'Or Twin Room is another unit that is designed for two, but can have an additional bed added upon request. 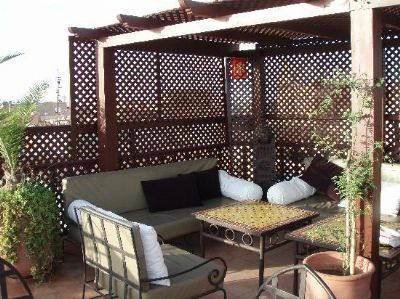 The Marguerite Suite is the largest first floor apartment and includes a Moroccan style sitting area, as well as a private bathroom, and a patio. The Gentiane Twin Room is designed for two adults, but offers you the option to combine it with the Bleuet for additional. Throughout the property, every timeshare apartment or suite has authentic Moroccan décor, paired with the comforts of air conditioning, toiletries, a hairdryer, and other special touches to make your holiday in Marrakesh more enjoyable. Contact Riad Aubrac Specialist Today!